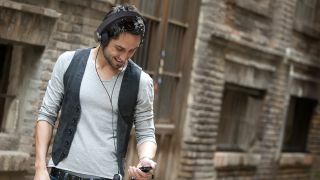 More smooth sounds from IFA 2012; this time it's Panasonic's new HXD series of cutting-edge headphones, replete with minimalist design and top notch sound quality. The Panasonic HXD3 gets the tunes flowing via a coloured metal housing and matte surface frame that incorporates finely honed noise isolation. It's a simple, no nonsense set of wired cans that aims for great sound quality. The Panasonic HXD5, meanwhile, gets an upgrade to 40mm drive units for greater dynamic range – read ear drum-pummelling bass notes. A reflective chrome finish and synthetic leather padding provide luxury threads in keeping with the premium sounds. The daddy of the new range is the Panasonic HXD7W, available in black or white. Again, we're talking 40mm drivers, but the oversized chassis design will extend those bass notes even deeper. The HXD7W is also equipped with a one-key remote and mic for use with a mobile phone. You can snag the HXD3 and HXD5 in September. You'll have to hold out until January, however, for the HXD7W.